Today, Twitter will launch its new video-centric product for the Apple TV, Amazon’s Fire TV, and the Xbox One. Perhaps unsurprisingly, its latest effort doesn’t focus on sharing posts and updates. Rather, it offers a stream of curated visual content from the main site, as well as other Twitter properties like Vine and Periscope. The app arrives just in time for Twitter’s groundbreaking experiment on Thursday, where it will stream a match between New York Jets and the Buffalo Bills. This is the first of many NFL games that Twitter will stream. It’s inked an agreement that lets it stream all Thursday Night Football games for free to its users. This is in addition to similar content deals with MLB, the NBA, Pac-12, and the NHL, as well as with Cheddar and Bloomberg News. Those using the app on the Apple TV will also be able to watch “live premium video” and tweeted video clips side-by-side, which sounds horrendously distracting. 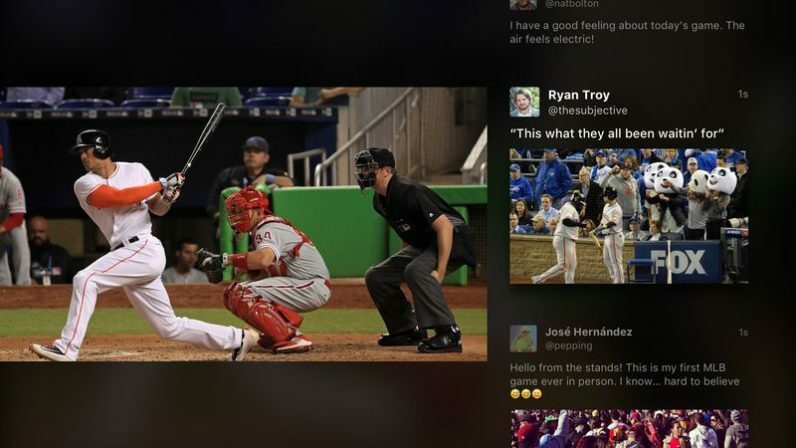 Viewers will also be able to browse a Twitter timeline (but, again, not post) as they watch live-streamed games. This has the potential to introduce NFL fans to Twitter’s features and community, which I suppose is the point. Twitter is currently suffering from a plateau in user growth. If this can introduce its service to a new demographic, it might revive its fortunes in this regard. Twitter’s new apps will be available in several overseas markets. The Apple TV version will be available worldwide, while the Xbox One one will be available in Australia, Brazil, Canada, Mexico, and the UK. The Fire TV and Fire TV Stick version will only be available in the UK.